November 27, 2014  Protests have ranged from peaceful disruptions to chaotic, resulting in scores of arrests. Residents want to resume some type of normalcy, and they're trying to help businesses get back on their feet. November 26, 2014  The decision not to indict the officer in the shooting death of Michael Brown touched off protests. Residents of the St. Louis suburb blame trouble makers and edgy police for some confrontations. November 25, 2014  After the grand jury's verdict was announced on Monday, protesters took to the streets in the St. Louis suburb. The white police officer will not face charges in 18-year-old Michael Brown's death. Grand Jury Decision Apparently Imminent In Ferguson, Mo. November 24, 2014  A St. Louis County prosecutor is expected to announce the decision of a grand jury that is considering whether to indict a Ferguson, Mo., police officer in the shooting death of Michael Brown. November 24, 2014  There is no announcement yet from the grand jury investigating the death of Michael Brown, an unarmed, black, 18-year-old. The panel is deciding whether to indict a white police officer in his death. November 22, 2014  A grand jury decision on whether Officer Darren Wilson will face charges for killing Michael Brown in Ferguson, Mo., may be near. The grand jury met behind closed doors on Friday. November 21, 2014  In Ferguson, Mo., preparations are being made by protest organizers, church leaders and businesses as they await the grand jury's decision in the fatal police shooting of Michael Brown. November 19, 2014  While the Nazis may have used the children's opera Brundibár as a propaganda tool, it also was a symbol of hope for the children who performed it. It is now a way to remember profound loss. November 18, 2014  The wait continues for a grand jury decision on whether a white officer who killed an 18-year-old black male should be indicted. A panel will study the issues that Michael Brown's death raised. October 28, 2014  Low-income residents looking for a home may qualify for vouchers. The Chicago Housing Authority has opened its waiting list for the first time in years, and advocates say that's a welcome turnaround. October 24, 2014  Near Ferguson, Mo., young people are taking the lead in protesting police brutality. Many say they had never considered activism before, but saw Michael Brown's shooting death as a call to action. October 23, 2014  The argument over how race plays a role in the interaction between police and residents of color has flared in the aftermath of the shooting death of Michael Brown. That's surprising to some of the small city's white residents who say the depiction of Ferguson is all wrong. October 3, 2014  Hundreds of people have been waiting up to eight hours to get one last taste of what they say is the "best hot dog ever," at Hot Doug's in Chicago. September 29, 2014  One major study found sexual assaults are lower on campuses of historically black colleges and universities. But some question those numbers and whether HBCUs have the resolve to address the issue. August 22, 2014  Heroin and prescription drug overdoses are the scourge of some American suburbs. 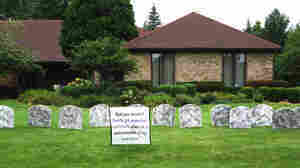 Advocacy groups are trying to raise awareness of the problem with a traveling display of headstones.